It's been a bit since this page got updated - sorry about that! 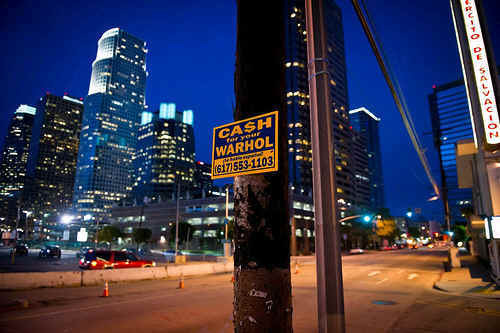 The day-to-day stuff is going out via Facebook, Flickr, and on Twitter @cash4yourwarhol. 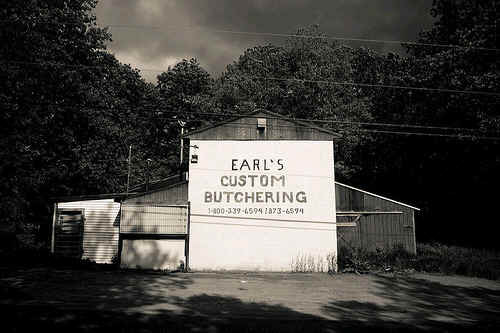 Join me there, or just drop me a note directly and tell me what you've been up to. There is some new stuff coming up soon, such as some new CFYW designs, some developments with Mr. Lee, and a show in California that will launch a new direction for CFYW - I'll be sure to post a heads-up here as well. I've been up in Maine recently, driving around roads I haven't been down before just to see what's around the bend. I posted some images to Flickr, such as the one on the left. It was taken near Albion. I've also been messing around a bit with de-saturated finishes - let me know what you think. 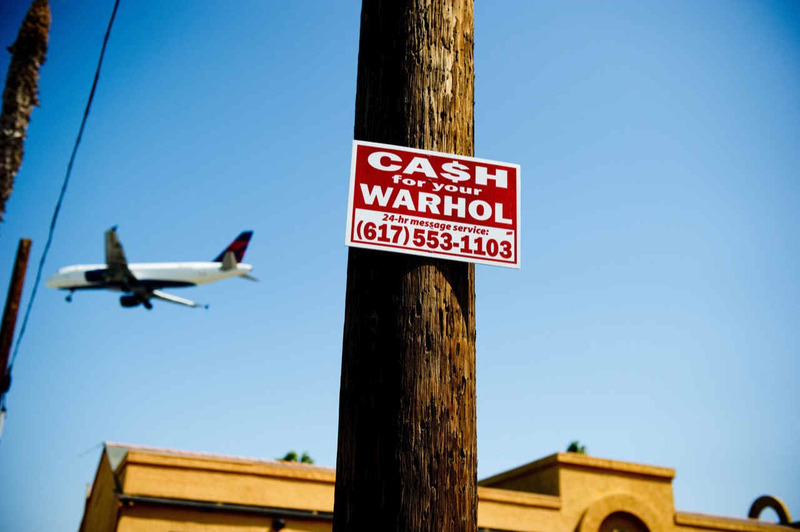 I was in LA in May, seeing some friend and taking the occasion to put up some advertisements for the growing global empire known as Cash For Your Warhol. 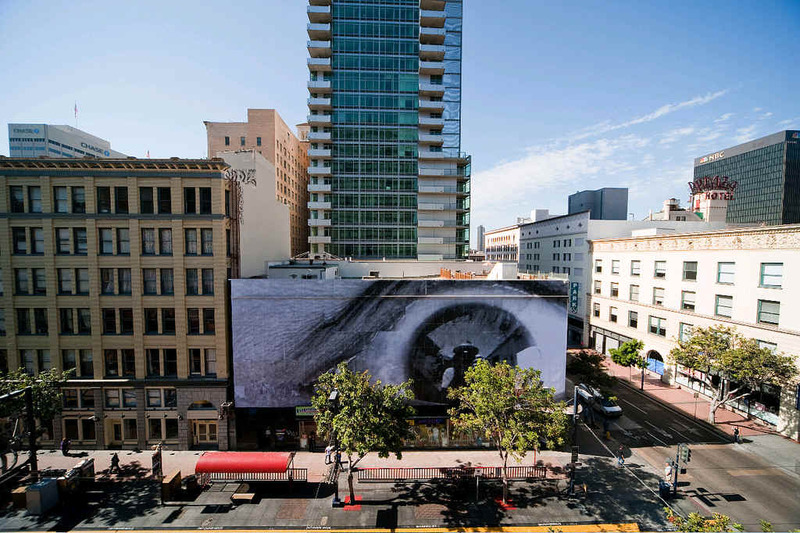 The installation on the left is in Downtown LA (d'uh!). We got a bunch of calls from the 310, 213, and 323 - thanks for the love, LA! CFYW will be back in August for a group show in Venice curated by my friends Jaime and Steven at Brooklyn Street Art, which includes some of our favorite artists. Stop by if you can - I'll have stuff you can take home and show parents. Our friends at BLDG Refuge in downtown Covington (KY) released my second screenprint. This one came out great (can I say that? ), thanks to Mike Amann's printing skills. The edition is sold out, but we'll make more soon! 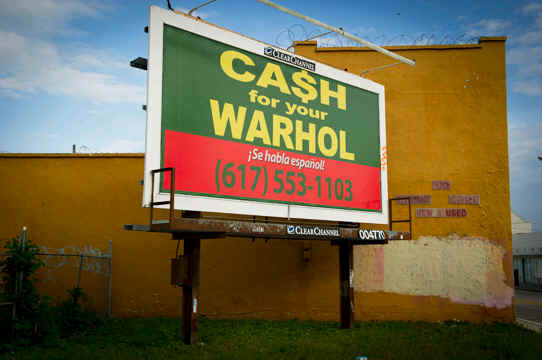 Cash For Your Warhol had an awesome time in Miami. Met some great people and caught up with old friends. There was so much going on in Wynnwood...there was almost no way to keep up. Special thanks to Jonathon and Kate at J. Riggs Fine Art for the fine hospitality and for letting me show my work in their space! I was a part of a group show at Singer Editions (Boston). Curated by Kathleen O'Hara and Beth Kantrowitz, produced by Jonathan Singer, and featuring a handful of artists infinitely more talented than I am... how could I say "no?" Singer Editions Gallery, 300 Summer Street, Boston. More details here. 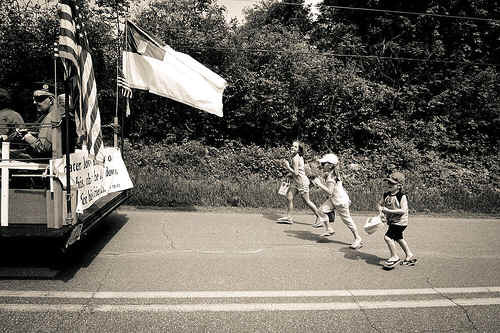 I spent a week in 2010 at The Windsor Fair (Windsor, Maine), where I shot a million photos, a few of which were actually good enough to share. 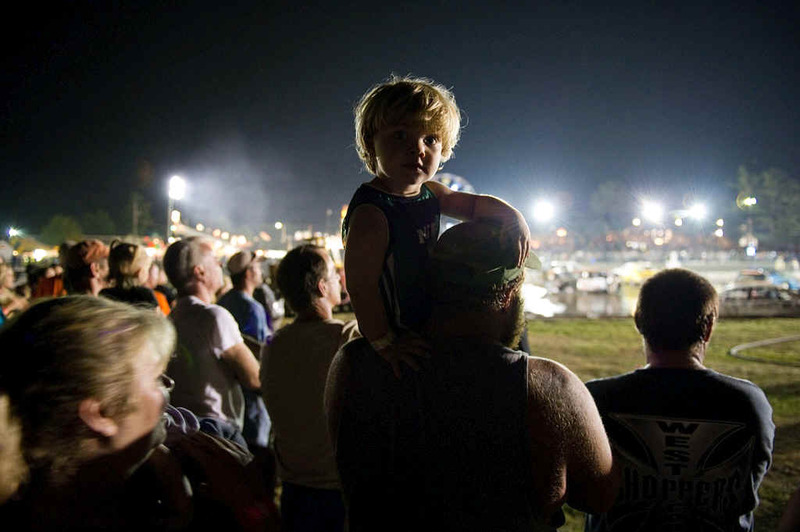 The one to the left is of my faves, shot at the demolition derby. I got to hang with the drivers and families, and while I don't normally take photos of children without permission, this kid kept staring at me...so I said to myself, "Sure, what the hell." I got one off, with no prep, and this is what turned out. Looks even better big. More photos from the fair here. 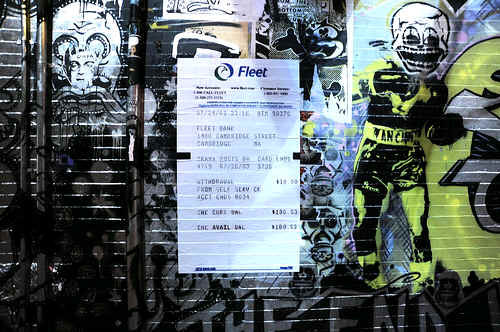 I was really glad to be a part of Public Ad Campaign's Toronto invasion - TOSAT. Founded by Jordan Seiler and previously organized in NYC and LA, this is a movement that is very exciting. Too long to explain in this setting, but I invite you to read all about it here. This is of the works I contributed to the project. Thanks in large part to c-monster for the inspiration when she organized this. My photographs are featured in the catalog of "Viva La Revolucion," a group shot now showing at Museum of Contemporary Art, San Diego. Curated by Pedro Alonzo. 20 artists from 10 countries, installations inside and outside the museum. It was a blast to be there documenting it all. Check out the book here. Shepard Fairey has put out another new book, "MAYDAY," which features some of my documentation of his work this year. There are also be a couple of images in the new book that my pals at Wooster Collective published. 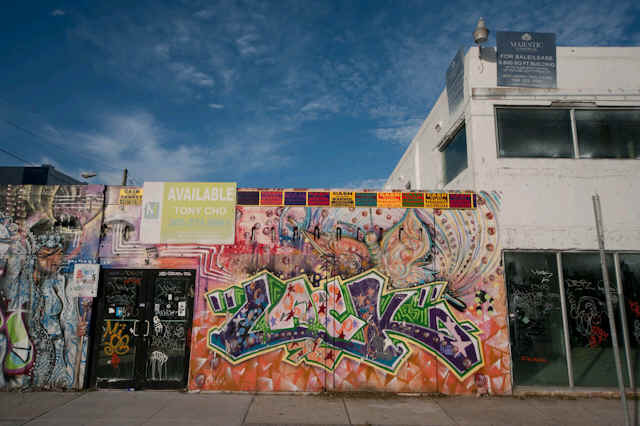 It's called "Trespass: A History of Uncommissioned Urban Art." It's a beauty! In January, 2010, my work was on view at Montserrat College of Art. 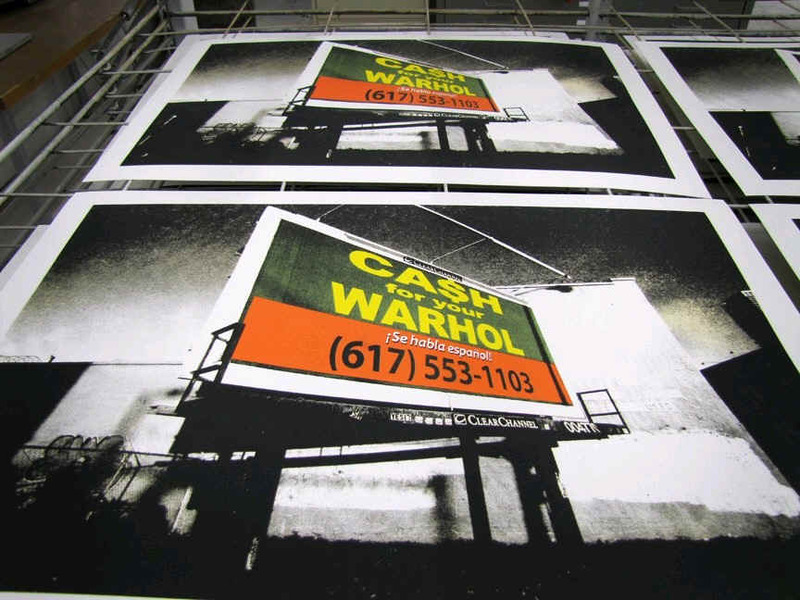 "100 Cash For Your Warhol Signs" was at the Carol Schlosberg Alumni Gallery, Beverly, MA. It featured the signs, screenprinted in Warhol's palate, and about 20 photographs of the work in situ. Details here. They also included in image in the school's 2011 catalog - thanks! One of my fave installations in San Diego this past July. Over 100 others can be viewed here, sorted randomly. 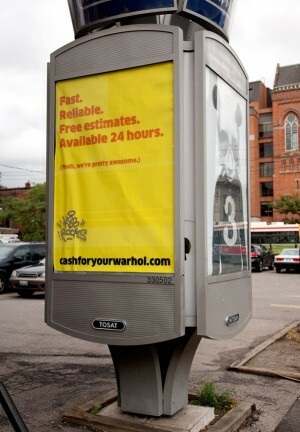 If you have any Warhols you need to part with, please visit our web site. ` The Wall at Central Square continues onward. 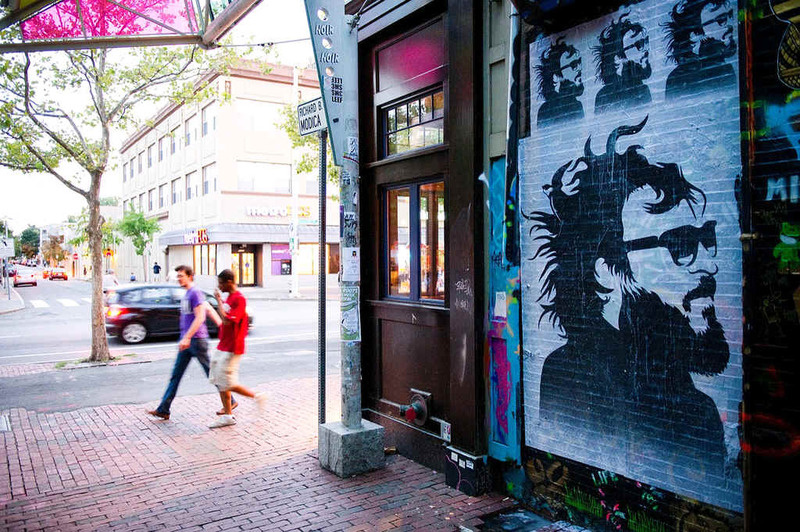 Here is a recent installation (work by Shepard Fairey). More photos at the flickr group, now ably admin'd by Lukwam. Not Rocket Science was created by Geoff Hargadon in 1996.